My semi-cascade juniper in need of training. The Han-kengai bonsai style mimics nature as found on cliffs and on the banks of rivers and lakes. The trunk grows upright for a small distance and then bends downwards/sidewards. Loving bonsai is about loving your great grandchildren—a love that can, if the art is carefully practiced, endure for generations. In part, it’s this idea of a trans-generational love narrative that attracts me to bonsai and sent me on a quest to find a practicing bonsai master in California. I found many masters. I realized, after settling in with one to learn the basics of this horticultural art form, that part of the art is about understanding and accepting my own aesthetic values. To start out, I would have to listen and think about my bonsai–for a long time. While the art of bonsai is often associated with Japan, horticultural historians say it actually originated first in China, and then spread eastward to Korea before reaching Japan. The practice of shaping tiny trees to mimic or stylize nature was spread by Buddhist monks who wanted to bring the “outdoors” inside their temples. From ancient paintings and manuscripts, Asia scholars found “artistic” container trees were being cultivated by the Chinese around 600 AD, but many scholars think bonsai, or at least potted trees, were being grown in China as far back as 500 to 1,000 BC. Bonsai first appeared in Japan during the 12th century. This 390-Year-Old white pine tree survived the bombing of Hiroshima. 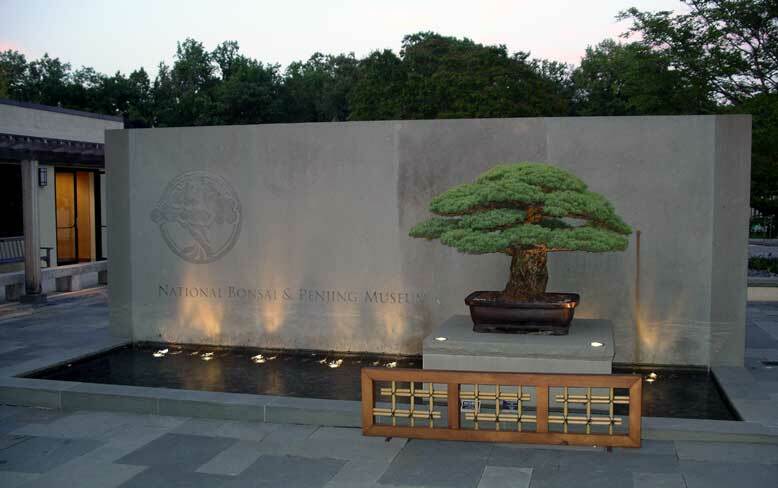 It was donated to the U.S. Arboretum bonsai collection in Washington, D.C., by master Masaru Yamaki in 1976. Careful pruning, wiring and shaping helps relieve stress. Constantly caring for a plant can help develop mindfulness. Working with nature, including bonsai trees, creates peaceful feelings. 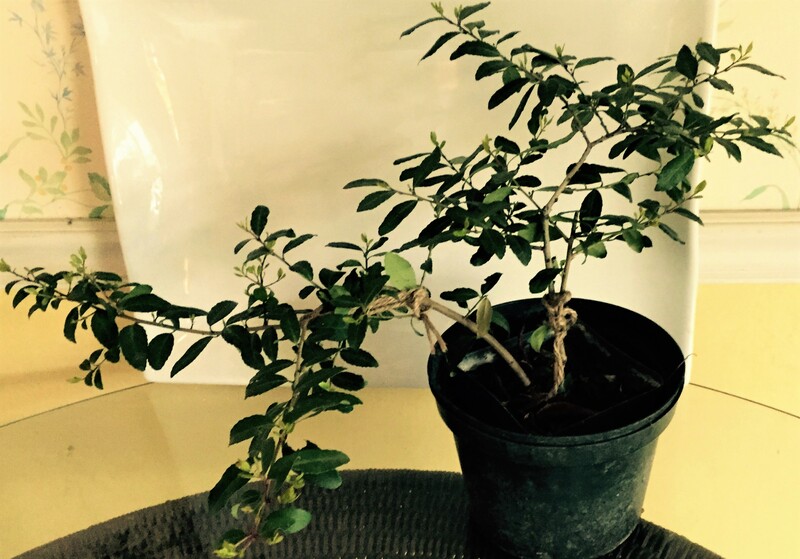 Successfully growing and caring for a bonsai tree can create a sense of accomplishment. Improbably, I appeared at the gates of a bonsai nursery in the San Fernando Valley a couple of years ago prepared to listen and learn about bonsai from a master. I was willing to consider accepting a tree into my care. Killing the plant out of ignorance wasn’t part of my plan so I’d given taking on the responsibility some thought. That day I learned bonsai literally means “tree in a tray.” The tree and container must form a single entity, work together in a design sense. The most desired containers for the finest Japanese bonsai are often exquisite antiques. I also learned bonsai is not a house plant. The miniature trees, like their full-grown counterparts in nature, are meant to grow outdoors. The master said he knew immediately when people brought yellow or graying bonsai into the nursery for his advice on how to improve the plant’s heath that it had been growing indoors. He said bonsai are miniature versions of species that grow naturally in nature and should be treated as such. I also learned would-be bonsai artists should have more than one tree to work on. The reason for multiple trees, my master told me, is so the artist doesn’t overwork just one tree; multiple trees keep the artist engaged in bonsai and help avoid frustration. He recommended sitting and contemplating the trees, listening for their stories, before taking action to shape those stories with wire and clippers into the narrative the trees want to tell. After a long walk in his small nursery where bonsai starter plants are cultivated, the master determined my artistic leaning was toward the “Han Kengai” form an ancient cascade style symbolizing the “overflowing potential for growth.” The style is characterized by trees grown in the way the tree or shrub’s trunk and branches stretch below the pot. The branches flow down and out, attracting the observer’s attention. Han-kengai bonsai at the Lake Merritt Bonsai Garden in Oakland, considered one of the best collections on the West Coast. I’ve lived with and studied the juniper given to me by the master for more than two years. It put out tiny berries this winter, to my delight. Over time I’ve considered its form and its ability to express my thoughts into the future. I spend a few moments every day contemplating this plant and have decided it’s time to take some creative action. April 9 to 10, the American Bonsai Association of Sacramento will hold its spring show, which includes demonstrations, classes, exhibits and sales of bonsai supplies. The annual event will take place at Shepard Garden and Arts Center in McKinley Park in Sacramento. I plan to pick up a few more trees and get some supplies. And I hope to take a workshop from Peter Tea, who has studied with masters Boon Manakitivipart and Junichiro Tanaka at Aichi-en Bonsai Nursery in Nagoya Japan. Tea is in the process of building his own bonsai nursery and studio in Auburn, CA. Show hours are Saturday, April 9, 10:00 AM till 5:00 PM, and Sunday, April 10, 10:00 AM till 4:00 PM. Demonstrations are Saturday and Sunday at 1:30 PM. Demonstration trees are included in daily raffles. I hope to learn how to better shape my tree’s narrative in the decades to come for those I love.